Travel is such an important part of life. It’s a great way to spread your wings. I learn something new wherever I go. This summer, I’ve had opportunities to visit a number of different cities. I traveled to family celebrations as well as chased my daughters as they pursue their passion for lacrosse. Whenever the schedule allows, we try to take time to enjoy the cities we visit. Sure, we hit the famous spots and that is always fun. On a recent trip to Nashville, we loved walking in the evenings, listening to lively music spill from the honky tonk windows and rooftops onto Broadway. We spent time on the beach at a tournament in Lakewood Ranch, Florida, and rode roller coasters for a day at Cedar Point while visiting Cleveland, Ohio. In addition to the major attractions, there are a few other things I try to do to get a closer sense of a place. If I can, I shop a local market like Cleveland’s Westside Market. I try to get out into nature by visiting a park. Finally, I make an effort to have a cup of coffee at a local coffee shop. We just returned from a few days adventuring in Nashville. During my time there, I stumbled across Caliber Coffee Company. I liked it so much, I went there two days in a row. Although the coffee was excellent, it was the friendly employees and energy that brought me back for the second time. 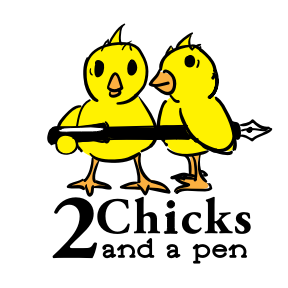 As you get to know our brand, you’ll see that the 2 Chicks are serious about giving. We have given our books to kids in hospitals, food pantries, and low-income schools. We’ve had support from generous readers and corporate sponsors. This is just the beginning! We are always looking for new and inventive ways to give. So, when I saw this board at Caliber and read that it was a way to pay it forward, I had to ask for details. Every sleeve clipped to the front and back of this ‘Shot of Grace’ board is a cup of coffee that was bought as a gift that day. Some sleeves have names of local people on them. You can call or text the person you’re treating and let them know they have a coffee waiting. But it was the other gifts that interested me even more. These sleeves are less specific. Instead of a certain person, they are made out to someone in need…a single mom…a freshman at the local community college…a newcomer to town…a daycare employee…a first responder…a step parent…a fireman…someone having a bad day. I imagined the smiles these tiny bits of thoughtfulness would bring to someone who needs a lift. I immediately thought of the 2 Chicks and our passion for giving. My imagination started spinning…who could I connect with using this opportunity? It didn’t take me long to decide. I couldn’t resist the chance to encourage someone who may be thinking of telling their story. The Chicks have found such amazing power in storytelling. Although I don’t know where it ended up, I hope the coffee brightened someone’s day and encouraged them to share whatever unique and powerful story they have to tell. It also made me start to wonder again about new ways the 2 Chicks might connect and share. I can easily get bogged down in details and logistics, but maybe giving doesn’t have to be as complicated as I think. As I was reminded again only yesterday, paying it forward isn’t only about the the news stories we see about the drive-thru at Chick-fil-a. Even more importantly, it’s the small, sincere acts of caring that are never noticed by the cameras but have an enormous impact nonetheless. What are some of your favorite ways to pay it forward in your life? What random acts of kindness bring you the most satisfaction? Let us know in the comments, readers! Cheers!